Common in West Coast. Timing: winter. Prefers Edge habitat, scrub, and backyards. 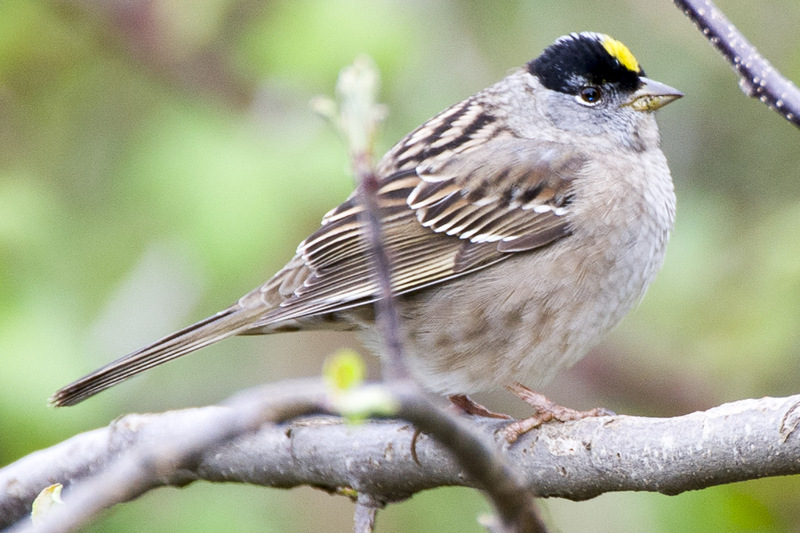 Largish sparrow with a short, conical bill; plumage is brown, gray, black with yellow crown. Very little studied, partly due to it’s northern breeding grounds. Population trends hard to estimate due to lack of studies. Diet includes seeds, insects, and probably fruits. Oldest wild individual recorded was 10. Population ~ 4 million and possibly stable. Great-tailed Grackle. Big, glossy noisy show-offs. Very common in southern Midwest and West. Timing: year-round. Prefers rural and suburban areas. Large with a long, straight bill; plumage is glossy black with yellow eye. Sometimes flock in tens of thousands – up to a half- million in Rio Grande valley, TX. One of our fastest expanding species. Diet includes seeds and arthropods, as well as small animals. Oldest wild individual recorded was 8. Population ~ 8 million.